It’s beautiful the colors are very vibrant I’m happy I ordered it.It goes with my decor very well I got for my basement I’m remolding and it looks gorgeous im very pleased with it. 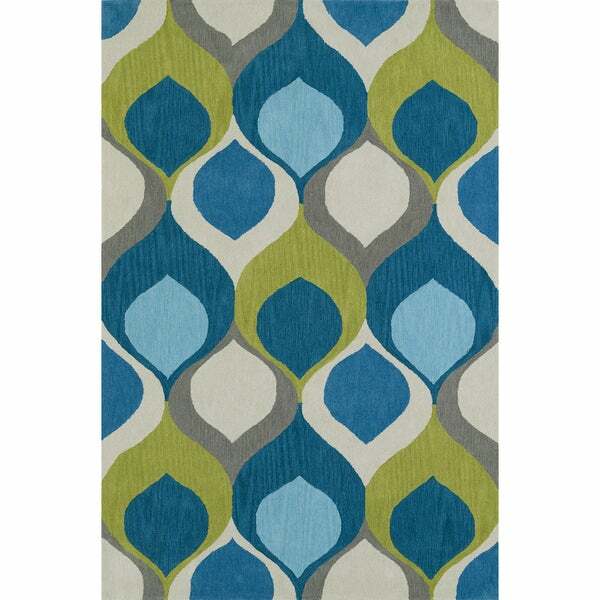 Cover your floor in hourglass shapes with this Addison Malia Bohemian-style area rug. Blue, teal, and lime colors form wavy lines for a modern, bold design, while durable polypropylene-and-acrylic fibers are easy to clean. Love the colors, they're very vibrant. The colors are nicely saturated and seem to be a little lighter than the photo. It's thick and very good quality. I'm very happy that I was able to get such a nice rug for a great price. You won't be disappointed! Great quality for the price! Excellent accent piece if looking for a mid century/ modern look. Heavier than expected which was a nice surprise. Great compliments from everyone. Summit Teal, White, Grey, Swrils Area Rug - 5' x 7'2"